There are no strict rules to follow the below process but most of the people will follow the same process in Bangalore. One important thing is to make a note of color name and number. Now color mixing is done through software. Vendor will mix the selected paint into white base of paint category. Make sure to note down the number of the paint for the future purposes. Painting is a five step process for new house(inside house). Applying Primer: This is the first step in painting process. Applying Putty:This process will bring smooth surface to the walls. To identify/test smoothness you can take a tube light and wall under that lighting , you will come to know smoothness of wall. Applying paint: Once putty was applied then paint quote will start. 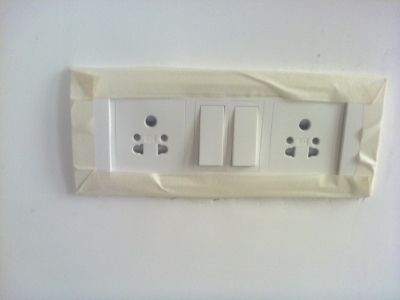 once you finish one quote of painting electrical people will fix switches. Once you finish all the works in house you can go for second quote. You can paint second quote once after Gruha Pravesham because of homam paint color may change.